What truly sets Fixi apart is its fixturing capabilities, predominately its ability to generate multiple, basic and or complex fixtures at once. We have worked closely with our clients to help build an innovative and powerful solution that no other system has been able to deliver. Basic fixtures can be created instantaneously with the click of a single button. See it in action on YouTube. Teams are fixtured to play each team once before playing each other for the second time. Each team is allocated an even amount of home and away matches. Furthermore, an even spread of time slots are allocated to each team, ensuring a fair fixture. Clashes are automatically avoided with existing allocations (i.e. other fixture matches, scratch matches and bookings), including matches played on layered courts. If you're closed on school and public holidays, users can easily skip these specific dates when creating a fixture. 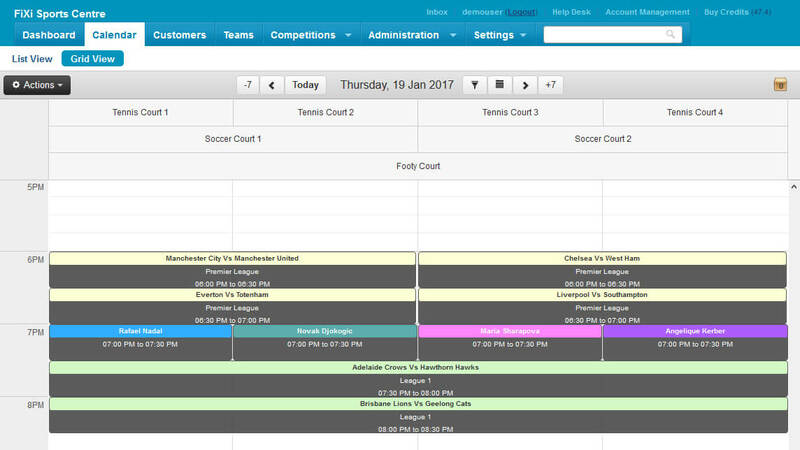 Adding time preferences for each team is made easy using a drag and drop style interface, this coupled with a sophisticated algorithm, ensures teams are fixtured to play at times suitable to them. Multiple fixtures can be created simultaneously sharing the selected courts and allocated time slots; this saves time, effort and consequently improves overall efficiency. Each team’s position in the fixture algorithm can be changed to manipulate the play order, a preview of the fixture can then be generated before commitment to the changes is made. Multiple blocks of playing times can be specified over multiple days, weeks, or even months. In addition, the same courts or alternatively different courts, can be allocated for each block of time, providing the necessary control and flexibility to create advanced fixtures. Fixtures can be created so that multiple rounds are played every week, or alternatively, on selected weeks, thus creating exciting double header rounds. 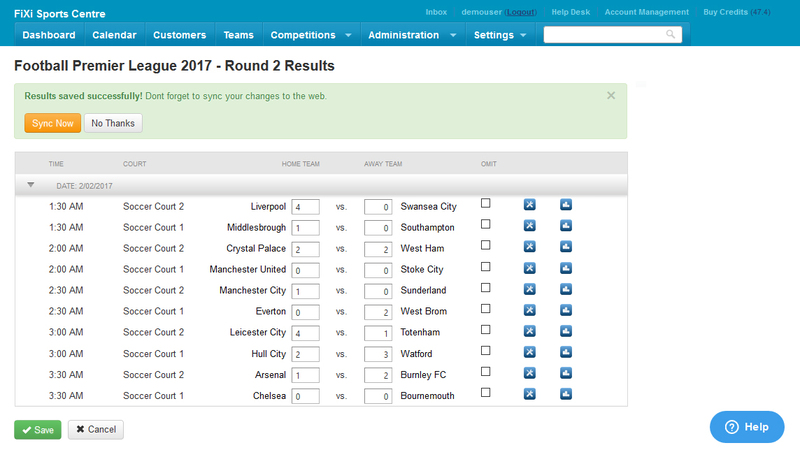 If your competition is full to capacity, this feature allows you to fixture some of your matches on an alternative day. Fixtures can be extended an unlimited amount of times over an unlimited number of rounds, this can prove to be very useful since the number of rounds for a fixture is sometimes unknown at the time of creation. Fixtures will at times need to be edited to cater for any changes that may occur in a competition cycle. With our easy to use interface, manipulation of every match is easy. The software provides a number of automatic solutions to address common problems. The swap function can for example, allow the user to easily replace a weaker team with a stronger team in a lower grade competition. See this particular swap scenario in our video. A Finals Series can be created to take place at the completion of a round robin fixture. There are many built in formats to choose from, spanning from one to multiple rounds. Explore the available templates by watching our video. Fixi’s online registration system takes the hassle out of organizing a new season of registrations. Create your competition in Fixi and wait for the registrations to come in, save time on data entry and alleviate errors. Optionally, request that teams make an initial payment using PayPal or Credit Card to secure their place. Watch our video for a quick overview. Ensure your business stays up to date with the latest technologies. 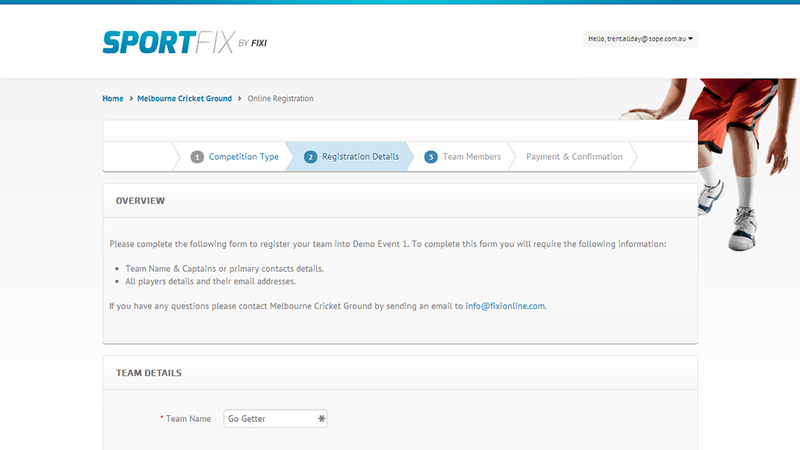 Fixi allows users to create their own online registration forms with direct access to data upon submission. No more tedious data input, no more paper registration forms. The online registration form can be configured to cater for your specific needs. 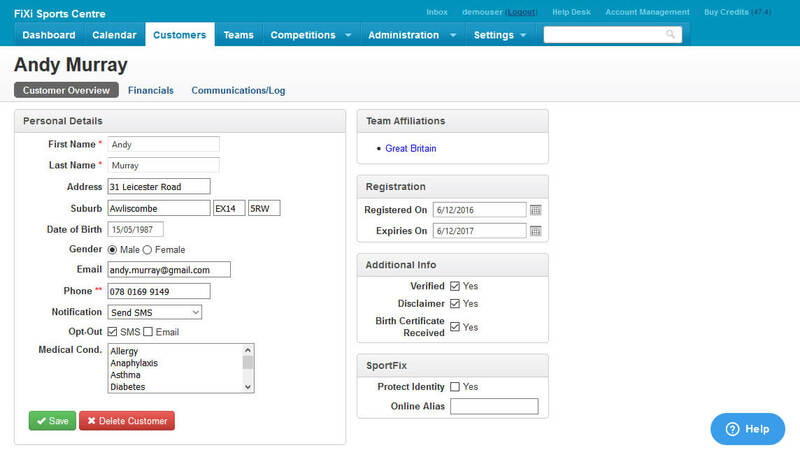 Forms can be created requesting details of the team captain only, or the entire team, while number of players and age constraints can be specified. In addition to regular details of date of birth, gender, contact details etc., Fixi allows users to create custom questions and attach links to their ‘Terms and Conditions’. Although online payments are optional, a good way of ensuring teams are committed to playing for the entire season is to request an upfront online registration payment. The process is simple; specify the fee and we will handle the rest. Once a registration is complete, you can decide how the payment will be allocated within Fixi i.e. as a registration fee, an upfront season fee or first match fee. Our online registration system accepts both PayPal & Credit Card. An alternative option is that of private registrations, where invoice payments can be selected. 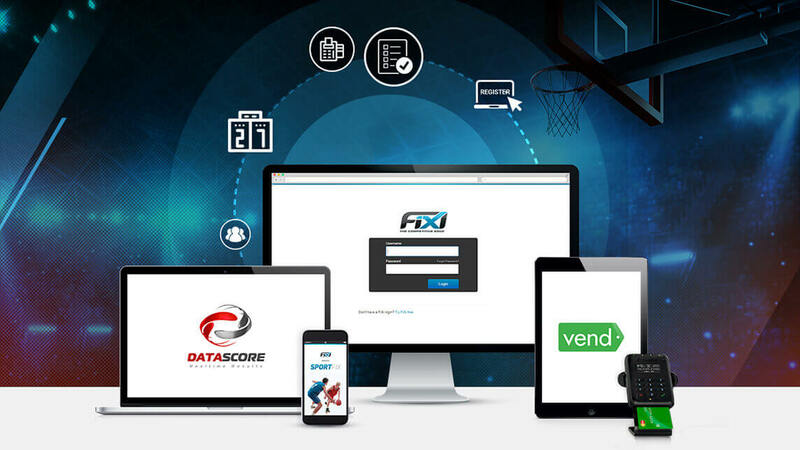 Once your teams register online, all data is automatically imported into the Fixi System increasing your data accuracy and saving you endless hours of manual data entry. All you need to do is assign them into a competition and notify them when their first match is, this can be done via email or SMS. Keep your teams up-to-date with the latest information by instantly publishing fixtures, results, statistics and ladders to multiple platforms. See our video for a quick overview. Publish to your own website by integrating the Sportfix widget. With compatibility features designed to be embedded into any website and a stylish interface, what better way to keep your clients informed. Instantly publish to our iOS and Android mobile apps, downloaded for free from the respective stores. Publish to sportfix.net – a directory of sporting venues. Perfect for those without a website or those looking to increase traffic to their own website. Take control and manage all your courts. Our software can accommodate for complex court structures, multi-purpose courts and sport specific courts. Does your sporting facility have a complicated court structure? Can your football field be divided into multiple futsal courts? Have you had trouble representing this structure with alternative solutions? Fixi puts an end to this common problem by supporting a multi court layering system. If multiple sports are played on each, or some of your courts, our software can be used to assign as many sports as you like to any given court. Ensure matches are allocated to each court by restricting courts to a specific sport. 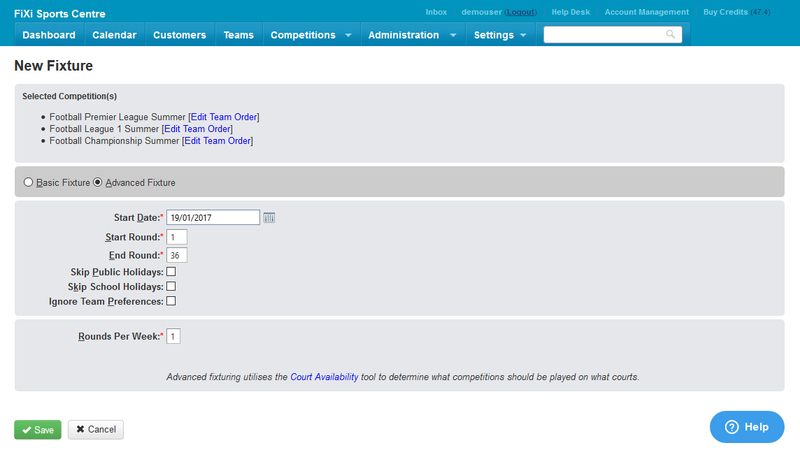 Specify which competitions are played on which court, on what days and at what times. The calendar displays all your competition matches, friendlies and casual bookings for a given day. For each allocation, you can see the start time, end time and court utilised. All functions that are required for the day to day operations are also made available on the calendar; serving as an ideal platform, to manage your business. The list view provides a list of all the allocations in chronological order. Users can write notes against each allocation and perform other important administrative functions. The grid view provides a visual representation of the allocations for the entire day to easily identify vacancies. Allocations can easily be moved around, resized or removed using our easy to use drag and drop interface. The management of casual court hire is a common requirement for many sporting venues; however, this is often neglected by many of the available software solutions – requiring you to purchase additional software. Fixi delivers a fast-effective solution, that allows users to easily create and manage recurring bookings, that span over multiple days, weeks or even months. Non-competitive, friendly matches can be scheduled by creating a scratch match and selecting any two teams within the system. The swap box can be used to switch teams from any match, in any competition on a given day, providing operators with the required flexibility for last minute changes. No matter how well a fixture is created, last minute changes and forfeits will regularly occur, causing all sorts of headaches. Fixi eases the pain by providing users with the ability to replace teams quickly and effectively. Quickly enter new teams into the system using the bulk add tool. Add discounts, bond payments, manage players, participating competitions, financials and playing time preferences. Invite team admins to manage their details and maintain a communication log for each team. 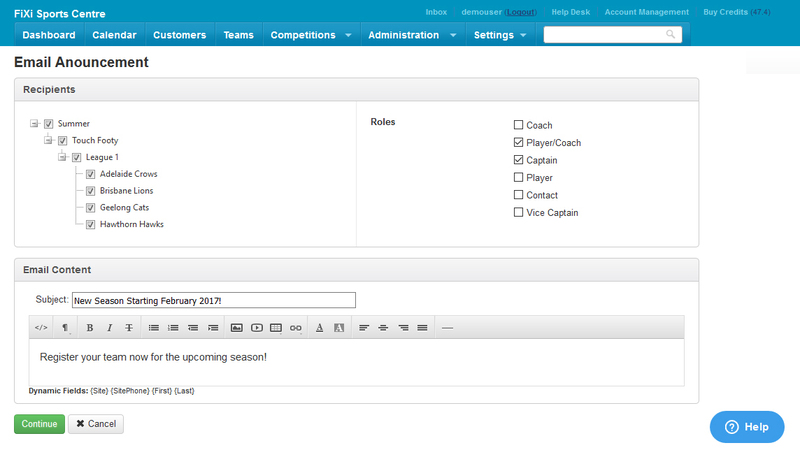 Add existing players or create new players, assign roles, shirt numbers and manage the status of each player. The software offers functionality for teams participating in multiple competitions at once. Ensure data integrity and avoid the duplication of data by not having to enter the same team details more than once. 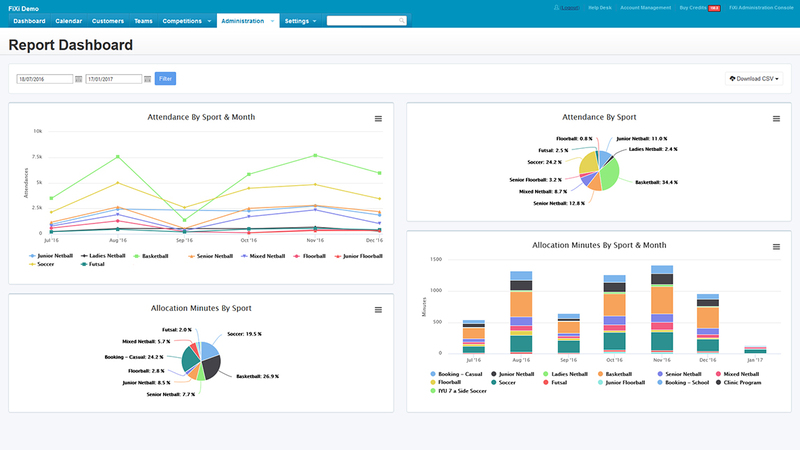 All team fees are stored directly in one central location allowing users to easily track, report and action outstanding balances with confidence. Included is the option to track registration fees, season fees, round fees and manual account adjustments. 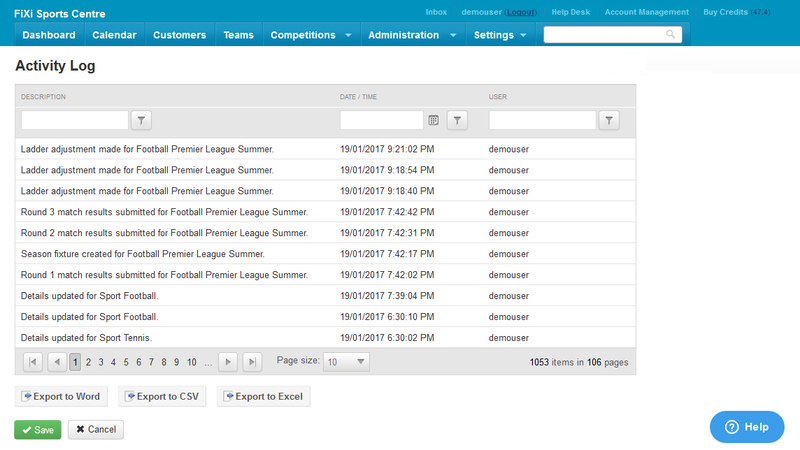 Keep data up to date by inviting team administrators to manage all of their details online. Maintain control by optionally restricting certain functions such as the ability to add new players. Do you have a list of existing teams in excel or any other data source? Easily import these into Fixi using our easy to use interface. Improve data integrity by merging duplicate entries with our team consolidation tool. Quickly enter new customers into the system via our easy to use interface. Customer details, financials and communications can all be managed via the customer portal. Store all contact details in a centralised customer database. Record medical conditions for each customer, to better assist in the event of an emergency. Retain existing customers by offering personalised services and communications such as the ability to opt out from notifications. Optionally create an online alias to protect a customer’s identity when publishing data online. Keep track of the registration and expiry date for each customer. Fixi offers functionality for customers, allowing an affiliation with more than one team. Manage booking fees and payments for a customer; make, track and record financial adjustments. Import an existing list of customers into Fixi via our easy to use interface. Merge duplicate customers using our customer consolidation tool and improve data integrity. See this tool in action. The system encourages fast data entry by offering an easy to use interface that can be accessed from multiple areas within the system. 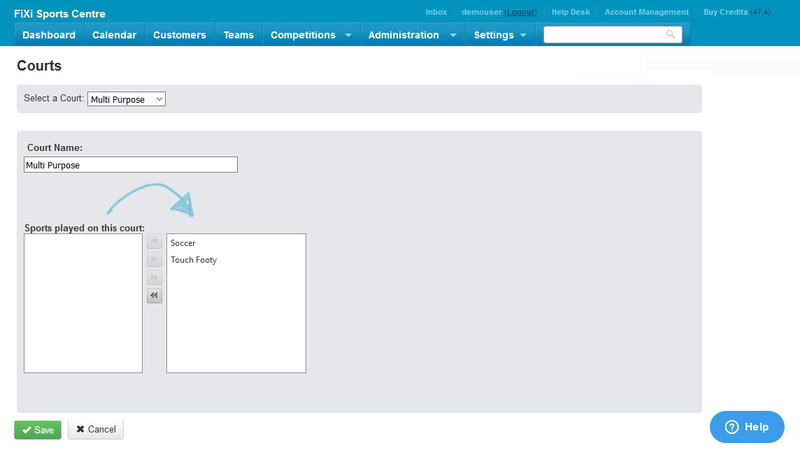 Enter custom points for each team overriding the default user-defined values in the division settings; this proves useful for sports such as tennis and volleyball, where teams can earn additional points for winning a set. Scores are automatically generated for forfeit matches with the user defined values in the division settings. Need to postpone or reschedule a match, but want to release all other results for that particular round? Fixi allows users the option to easily omit selected matches before publishing. Each player’s statistics can be entered into the system. These include: scores, votes, attendance – for eligibility to play finals, and cards for the suspension of players. The statistics can in turn be used to generate a variety of reports that can even be published online. Allocate votes to each player and easily generate reports such as most valuable player. Votes range from one to three stars and can be hidden until the end of the season. Enter the score contributed by each player and easily generate leading scorer reports. Assign yellow and red cards to players. A red card leads to an automatic suspension of the player. Yellow cards are accumulated over the duration of the season and the player will be suspended once they receive a user specified amount. Record the attendance for each player and ensure they meet the minimum amount of regular season matches to be eligible for finals. Take advantage of an automatically generated ladder and end the forever long hours of manual error prone calculations. Each competition has parameters defined for a win, loss or draw. All that is required is for the results to be entered. Need to override the automatically generated ladder? 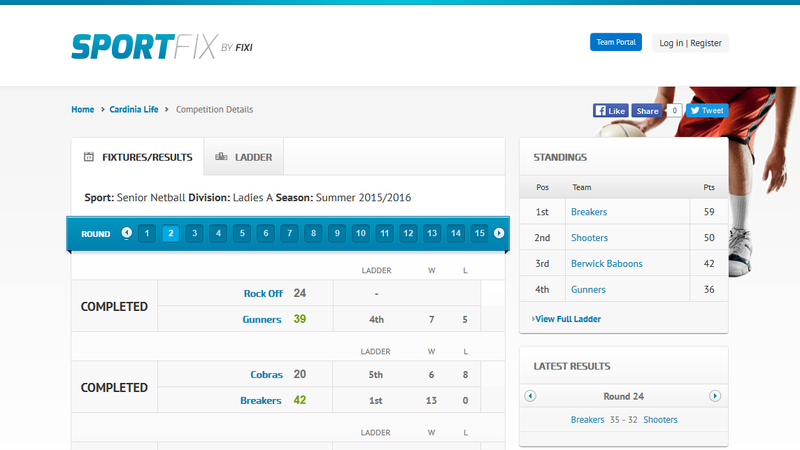 Fixi delivers a completely customisable ladder where each value can be overwritten. The ladder can easily be reverted back to the original values if desired. Need a different ladder for different sports? 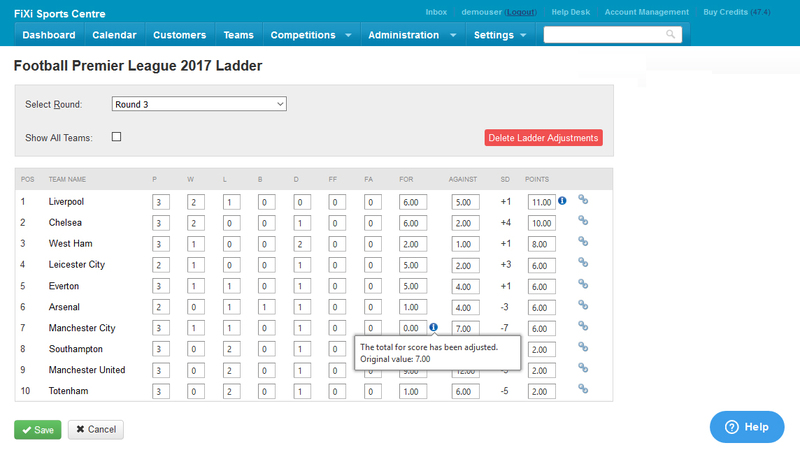 Configure the ladder to use a percentage or a +- difference, decide if bye matches and forfeits should be treated as played matches, choose whether or not the win and loss count is incremented for teams involved in a forfeit and show or hide any column before publishing. Users can link competition points; this is especially useful for gradings. Teams can move from one competition to another without losing their respective points. Printing fixtures can be tedious with a great deal of paper being wasted. By sending the fixtures as notifications, not only will your carbon footprint be reduced but there will be an increase in convenience for customers. As notifications cannot be lost or misplaced like their paper counterparts, there will be less chance of team forfeits. It further allows you to increase communication with customers by sending out important announcements including events, special offers and fees. Send match notifications, announcements and marketing messages. Provide regular and timely communication with all customers and participants, by creating templates and configuring schedules. Send announcements and or marketing messages to existing and past players. All communications sent out are tracked within Fixi, allowing users to report on each campaign. Effectively monitor, evaluate and improve your business operations by generating scoresheets, print outs, analytical reports and accounting reports. Design a scoresheet or choose from existing templates built into the system - include match details, player names and shirt numbers. Print out fixtures, ladders, results, check-in sheets, statistics and much more for all your customers. Generate detailed executive summary reports across the entire system, including court usage, allocation breakdown, team numbers and booking management. 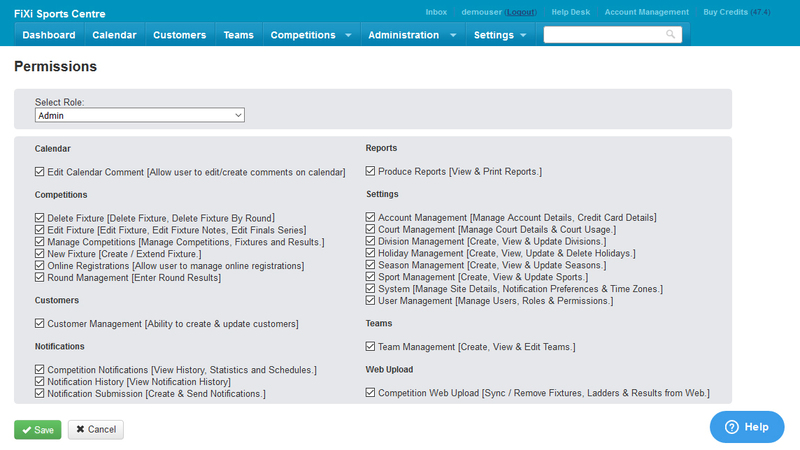 Quickly produce reports on teams and customers that have outstanding fees, allowing you to follow up and take action. All data within Fixi can easily be exported to CSV as it is your data, you own it. Add multiple user accounts to each subscription, assign users to a role and control access to areas within the application. In addition, improve communication between users by sending global announcements and private messages. Create a user account for all users that require access to the system. By creating different roles, users of Fixi can be categorised and later allocated access to relevant and specific areas. Typical roles include Managers, Staff & Umpires. Gain control by providing restrictions to certain areas within the application, this is easily achieved by setting permissions for each role and restricting access. If a manager is in charge of more than one venue, Fixi allows user accounts to have an association to more than one subscription. Upon login, the user can select which data they would like to work with. Send global messages or private message each user. This can be useful in providing friendly reminders to your staff members or for making important announcements. Important data is retained within the system so that users can access the information when and if needed and use this to make informed decisions about the future. All competitions are retained in the system, providing a valuable history of participating teams, results, statistics, ladders and eventual winners. 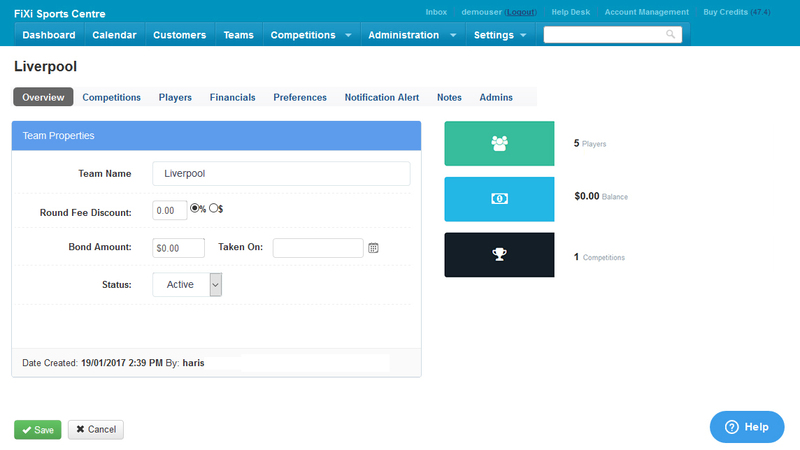 All teams are retained in the system allowing users to view competitions they have participated in, their playing time preferences, their financials, all their players and all previous communications. In addition, this feature identifies teams that are no longer participating, offering users the opportunity to win customers back via marketing campaigns. Our system automatically logs all important user activity. This can be useful in identifying which user has performed what task. These services integrate seamlessly with Fixi to help you further streamline your business. Vend is a cloud based point-of-sale and retail management software system that allows retailers to run their business in-store, online, and via mobile. Vend’s solution includes POS software, inventory management, E-commerce, customer loyalty and reporting analytics. A revolutionary scoreboard system by DataScore that outputs meaningful statistical data and produces impressive visuals for participants and spectators. 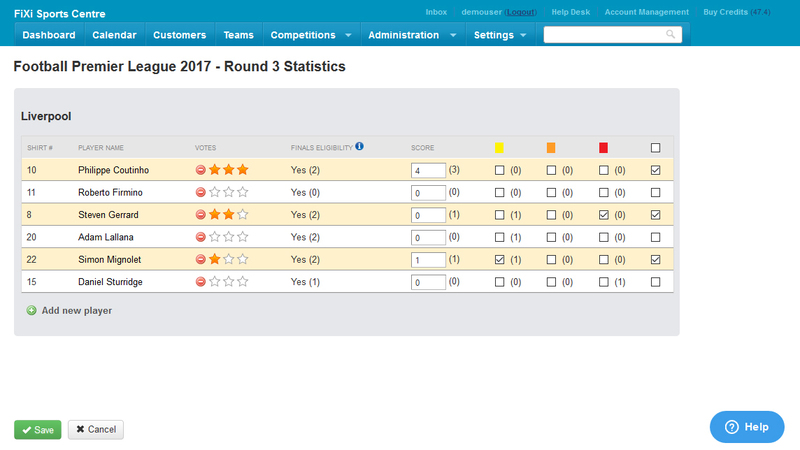 An interactive Player Check-In System by DataScore for teams to quickly and easily register their players for each game.